Perhaps you already believe your tweets to be as beautiful and profound as actual poetry. Chances are you’re wrong. 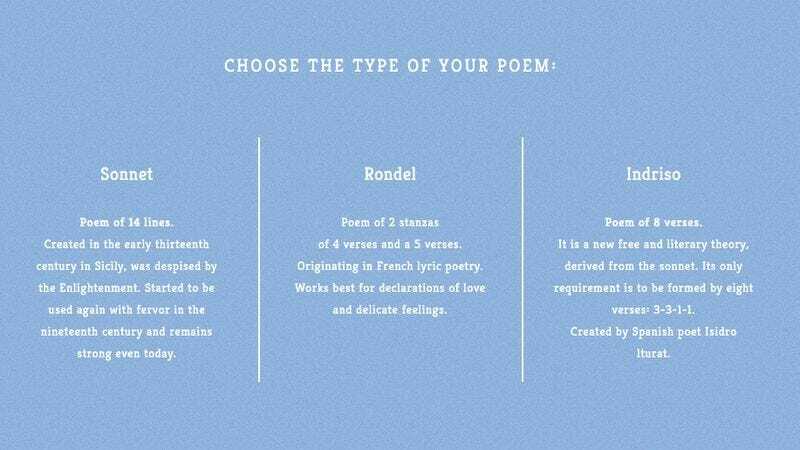 But you can turn your tweets into majestic, marginally coherent poems with Poetweet, a generator that pulls random tweets from your account to compose a sonnet, a rondel, or an indriso. So if nothing else, you’ll at least learn what those three different poem formats are. The generator is mostly good at determining which words rhyme with each other, but as with most tweet generators, it’s far from perfect. But shouldn’t poetry allow room for imperfection? Think on that, y’all. Has something along these lines? Alicia end up with Ghost Will? A season 2 spoiler: NOBODY DIES!!! To talk if that’s what you need! Your correspondent can verify that they are, at least, better than the angsty poems she wrote in middle school—though those, too, included shout-outs to Gilmore Girls characters and had nonsensical punctuation patterns.